I have a personal collection of armor models in the 1/72 and 1/76 scales. I have about 130 armored vehicles, spanning the history from 1916 to today. For several years I had been looking for an M47 kit, and there were none to be found. 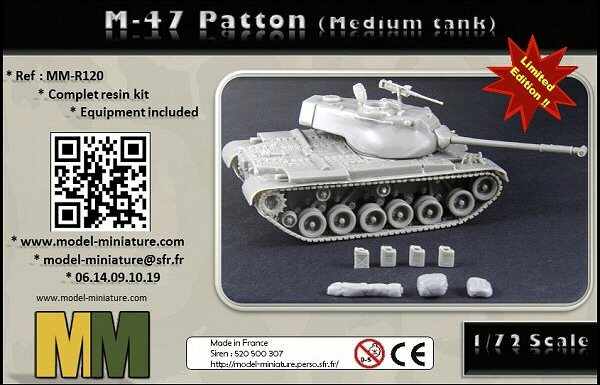 I had seen a M47 kit from Eastern Europe on Pat Storto’s modeling website, but it had accuracy problems and was not easily available anyway. When 1/72 diecast models of the M46 Patton came out, I thought the M47 would soon follow. It didn’t! So when I learned of this kit in 2014, it seemed like what I had been waiting for. The advertisement photo looked excellent, like styrene kit detail in a resin kit. But the negative review on this site almost made me pass on it. The flaws mentioned in that review were pretty serious. But I was so impatient to add an M47 to my collection I went ahead and ordered it. While it is one of the more problematic kits I have built, I still am glad to have it as I will describe. The good news: the worst problems in the earlier review have been fixed. The result is a pretty accurate kit of an M47. The bad news: it is an extremely difficult kit to build, probably only suitable for experienced resin modelers. Some design flaws make it very challenging to turn into a decent-looking model. The cast hull on my kit was the same ivory color as the turret. The sunken rear deck was fixed and although the fenders still look as fragile as potato chips, they did not break off in transit or during the build. The slope of the front hull is still more like an M46 than a real M47, but I was easily able to carve it into nearly the right appearance with a small knife. The track sections have been totally redone, with the chevron style pads and no more casting holes. Vintage M47 tanks are commonly on display outside VFW halls across the USA, so it is easy to find one for first-hand research. The rear overhang on this model has the wrong shape: the bottom edge is too hard, looking more like an M41 turret (but this too is easy to fix with a hobby knife). The actual turret has a more rounded bottom edge, which I tried to represent on mine. The resin is soft enough to carve down in a short time. The weirdest challenge to this model is the wheels and suspension. Some of the return rollers were molded onto the hull in spots where the road wheels should go! Why was this done? I have no idea. It was a challenge to cut them off without damaging the fenders, but I managed it. The next problem : getting the road wheels attached at the proper height. There was no easy way to do this, especially with the torsion bars molded onto the wheels. I used a thick rubbery adhesive made by the Super Glue company. It holds resin parts firmly together, but can be separated in the few days before it cures. I ended up gluing all the road wheels on at whatever height I could get them to stick as a first step. They looked uneven and somewhat collapsed, as if the tank had an extra 50 tons on it. My next step was to take off the wheels that were too close to the hull, and re-glue them at a better angle. The other wheels provided support as the adhesive cured. I did this over and over until all the wheels were reasonably even. They still are a little too low, but in this scale it’s not too obvious. This process will test the patience of most modelers! The barrel on this one looks longer than most barrels on actual M47’s I have seen. Some simple web research says that later model M47’s did have a longer 90mm gun than the M46 did. I assume this is the gun they chose to represent. The barrel was slightly crooked and had to be straightened with hot water and some careful bending. I considered replacing it with styrene rod, but then decided it was okay. The grab bars on the turret are so thin the resin will not hold its strength. One of them crumbled to pieces in my fingers, but I attached the parts that remained since tanks with broken grab bars were not unheard of. It is possible to give the turret more of a rough cast finish by lightly shaving it with a small knife edge. I painted it olive green and dry-brushed with lighter shades as is my preference. The tracks I painted black and highlighted them with metallic silver. After all these struggles, I ended up with a model that (to me) looks good enough. It has better detail than most resin kits in this scale and, after my simple modifications of the turret and hull, the accuracy is acceptable for my purposes. But if you have read this far, you can understand why some modelers would be tempted to give it up and just use the turret with a modified M46 styrene kit hull. I am happy to have an M47 in my display case. I guess you could call it a love-hate sort of kit!